LEDPRINTCO is located in Kansas City, MO , we take pride in the fact that we are a local, smaller company & that without a doubt we construct & supply the most premium, top-notch LED Light Box Snap Displays, Frames & Business Signage in the world, each one of our products is manufactured & fulfilled in the USA. We don't, again our products are MADE IN THE USA. Integrity is what binds LED PRINT CO , it allows us to generate word-of-mouth referrals & repeat business , please reference our reviews on Facebook, YouTube and here, our customers love us. Our mission is to remain clairvoyant at all times to you the customer with honesty, exemplary customer service and providing the most state-of-the-art products in the world. 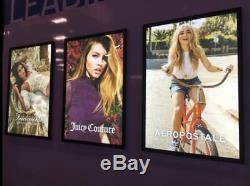 Our LED Light Box Snap Display Frames are designed & engineered to the exact specifications of the largest Movie Theater Chains in the world. 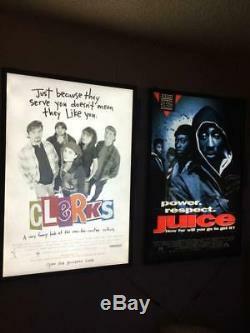 Our company is a major supplier of some these Movie Theater Chains. Essentially we provide every person in the world the capability of authentically incorporating true elements of the Cinema in to their homes or businesses. The possibilities are infinite with LED PRINT CO. 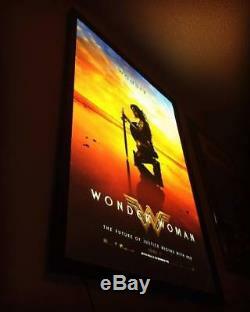 LED Premium Light Box Display Frames. 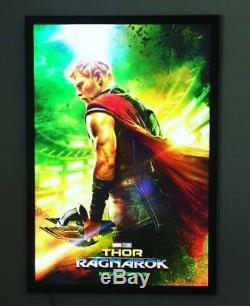 We provide the brightest & best LED Light Box Snap Poster Frames in the world. Perfect for Home Theaters, Man-Caves, Media Rooms, Bedrooms, etc. Super slim & sleek Only 0.96'' in depth. Top quality smooth Anodized Aluminum Everlasting Frame Structure 30% recycled materials - the finish on the visible border portion of your frame is immaculate. USA Quality Craftsmanship light will not escape through the edges of your frame, as it does in cheaply made products. Quick Poster Changes pull each snap side to easily open for removal/insert of poster. LED illumination evenly distributes vibrantly across our top-notch acrylic panels no hot or cold spots. A must for anyone that's nostalgic-minded. 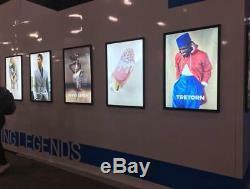 LED Light Box Poster Frames Features. Only 0.96'' in depth. Bright White Light at 5300k and UL Compliant LEDs. Black, Silver or Gold (message request). Up to 80% vs outdated fluorescent lights. Fast & Easy Poster/Insert Change. Snap open sides, insert poster/graphic & close. Easy installation, comes assembled, just hang up and plug in, back has drill holes, comes with mounting screws. Stock and Custom Sizes available. Made from 30% recycled materials. Any size up to 48 x 96'' (inquire). Made in the USA - craftsmanship is 2nd to none, no light "bleeding" out of the corners of the Light Box as seen with cheap Light Boxes. 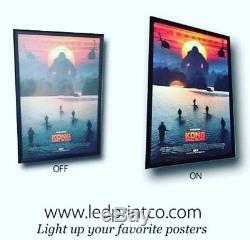 Specialized light guided panel style optical grade acrylic that diffuses the light without adding any dots or etching, no hot or cold spots, evenly illuminates your poster. We've supplied theater chains, Hooters Casino in Vegas, restaurants, hundreds of homes all around the world and would love to help you out. 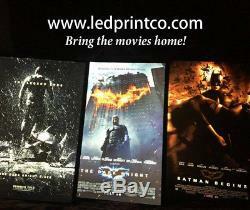 For help with functionality of our Light Boxes check us out on youtube as well; just search "LEDPRINTCO". 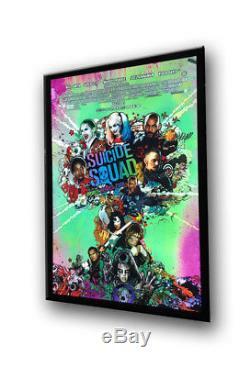 The item "Premium Custom 27x40 Black LED Movie Poster Light Box Display Frame Made in USA" is in sale since Tuesday, October 10, 2017. 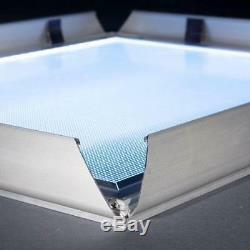 This item is in the category "Home & Garden\Home Décor\Frames". 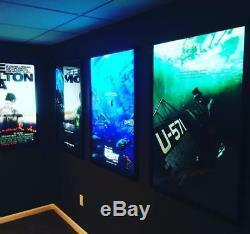 The seller is "lightingentertainmentdisplay" and is located in Elmwood Park, Illinois. 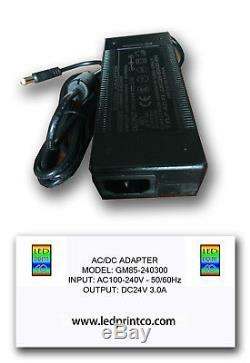 This item can be shipped to North, South, or Latin America, United Kingdom, Australia.